Following the inaugural fundraising match for the late Stephen ‘Stig’ Shannon from Downpatrick, his many friends organised and supported a friendly soccer match between the Flying Horse and Model Farm estates in Downpatrick. The match was played at Dunleath Park in Downpatrick on Sunday 10 November. The Model Farm team won narrowly by a goal at 4-3, and the teams will have to do it all over again next year. Such was the popularity of this match that all local players of note wanted to take part. One player even flew over from London for a twenty minute game. A raffle was later held at Savage’s Bar and £2700 was raised which was donated to PIPS and Aware Defeat Depression. 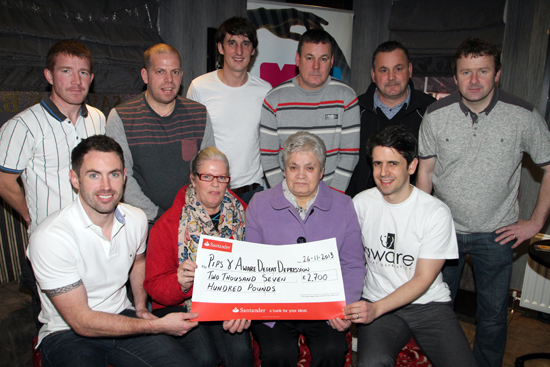 Pitcured at the cheque presentation in Savage’s were, back row, Stephen Sloan and Ian Hillsden, and Sean O’Donnell, organisers, Stephen Shannon’s brothers Paul and David, and event organiser Barry Kelly, with front row, Ray Cunningham, Aware Defeat Depression (ADD), Josephine McAteer, PIPS, Mrs Maura Shannon, and Kieran Hughes, ADD. The fundraising event in aid of charities for the late Stephen ‘Stig’ Shannon received much support.